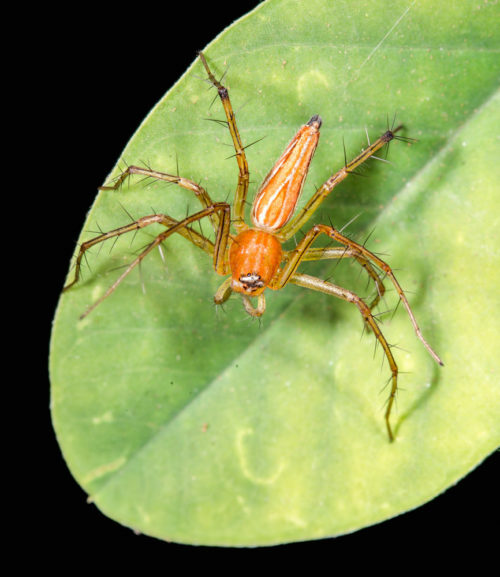 I found this female Orange Lynx spider under a leaf waiting in ambush. 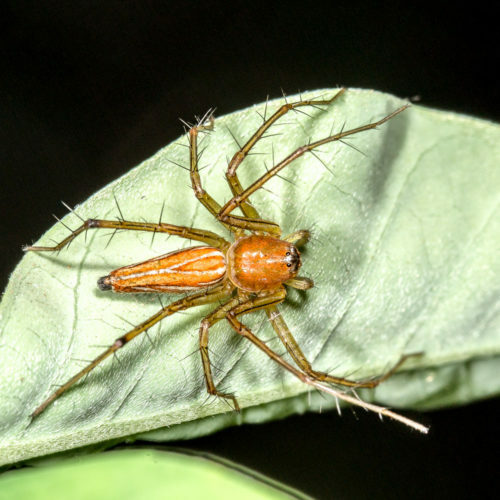 Lynx Spider belong to Oxyopes species, family Oxyopidae. 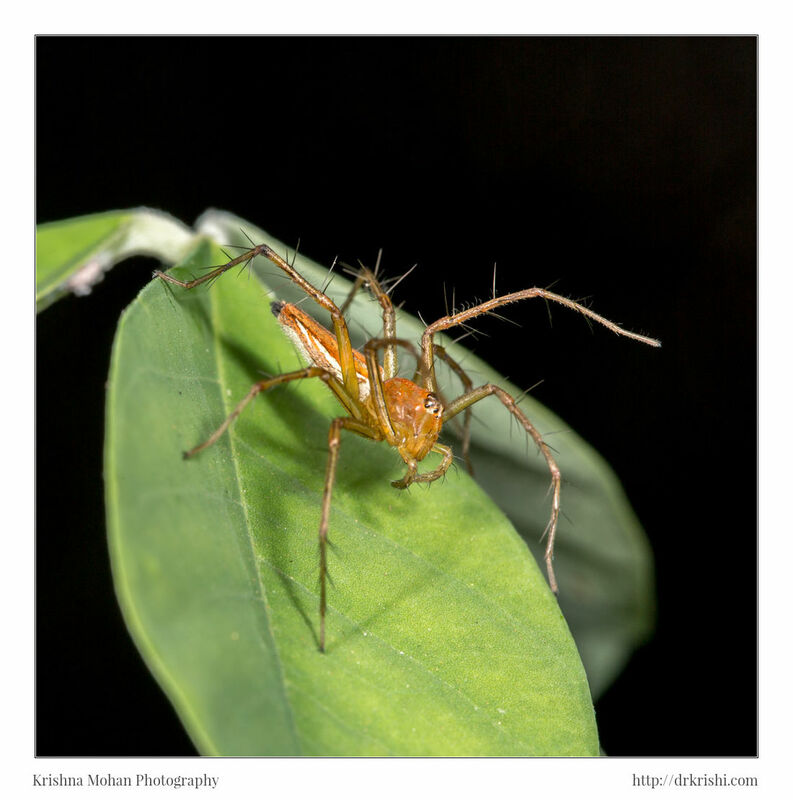 I was using my favorite macro rig consists of Canon EOS 5D Mark III with Canon EF 100mm f/2.8L Macro IS USM illuminated by Canon MT-24EX macro twin light flash. 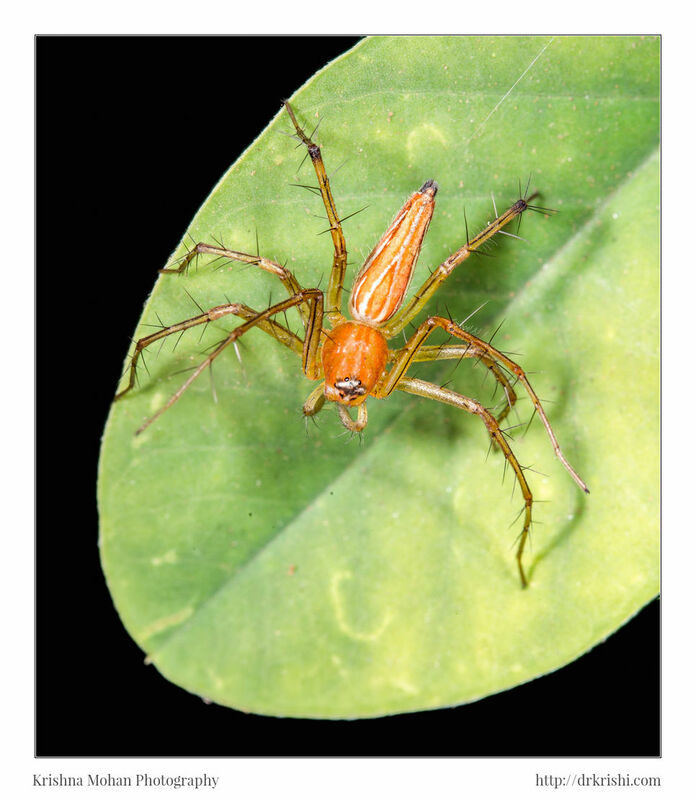 Their common name lynx spider refers to their quickness and agility; lynx-like in nature. 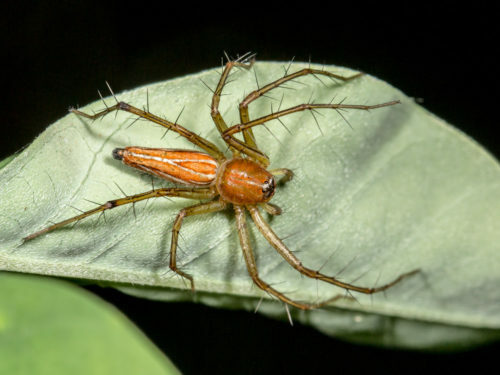 They are mainly plant-dwelling spiders, commonly found on grass, shrubs and trees. They are diurnal hunters with good vision, enabling quick detection of prey. They move around on plants, leaping from leaf to leaf. Prey is caught with legs, and often by jumping a few centimeters or more into the air to seize a passing insect in full flight or executing short jumps in pursuit of prey flying over plants. Oxyopid body length ranges from 3-25mm. Oxyopids are easily recognized by their high carapaces, distinctive eyes, numerous spines on their legs, and bright colors in some species. Some have cryptic coloration. The carapace is longer than wide, high and angular or rounded with a wide, flattened clypeus. 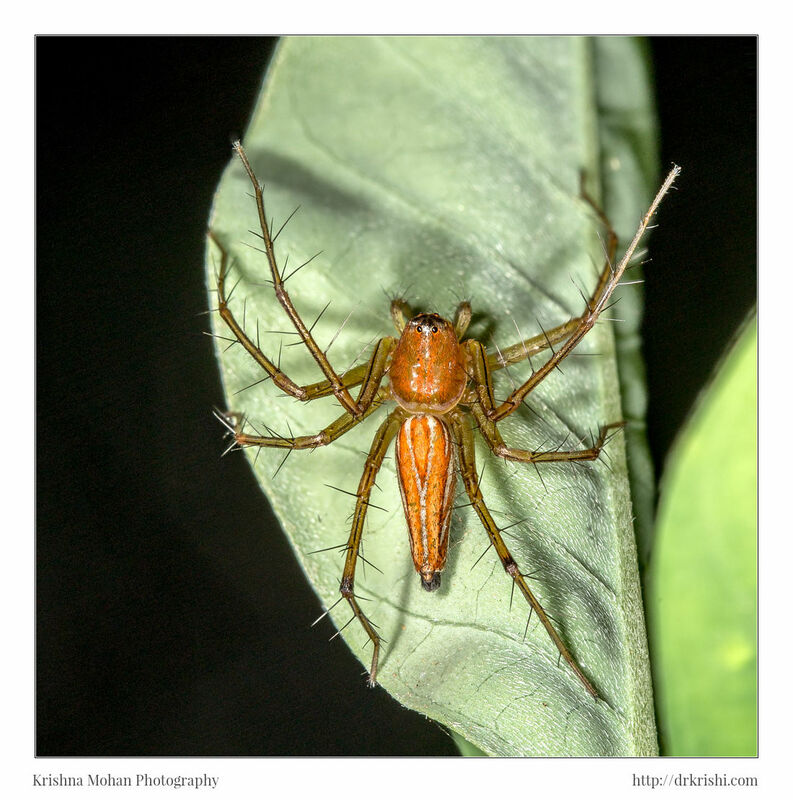 The abdomen is usually oval shaped and tapers to a point. Oxyopids have eight eyes. Cephalothorax high and rounded with the anterior part vertical and it then continues almost level for most of its length to a steep thoracic part. Eye pattern 2,2,2,2 with the very small anterior medians being over half way up to the front of the face and the posterior medians just beyond the top of the front face. Posterior row of eyes strongly procurved and equidistant from each other. Ocular quadrangle longer than wide and limited by the posterior median eyes and the anterior lateral eyes. 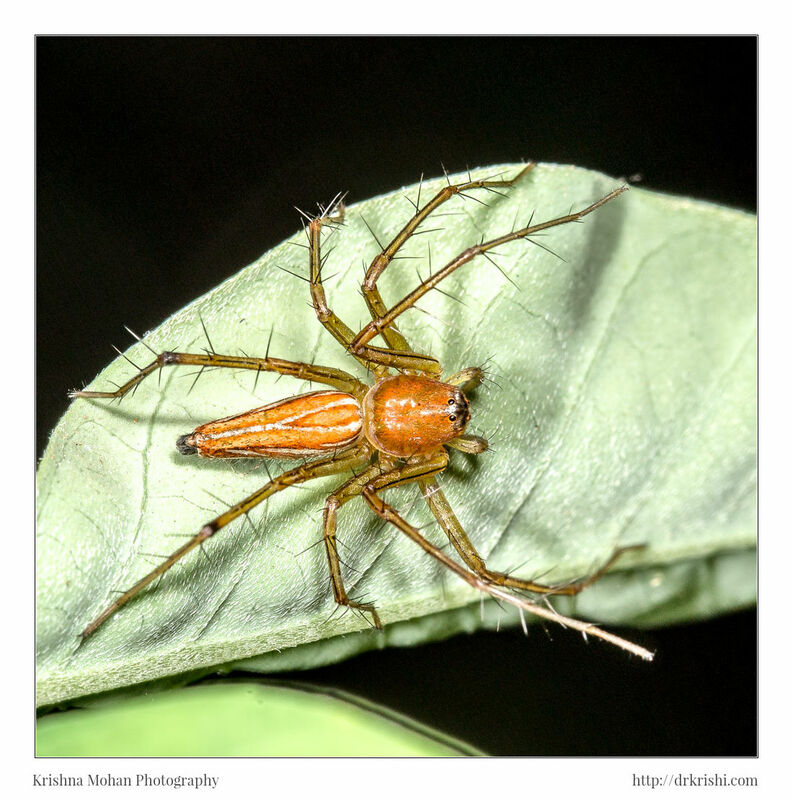 A thin black straight line starts from each of the anterior medians down the vertical face and continues down the center of the long pale chelicerae to the tip. 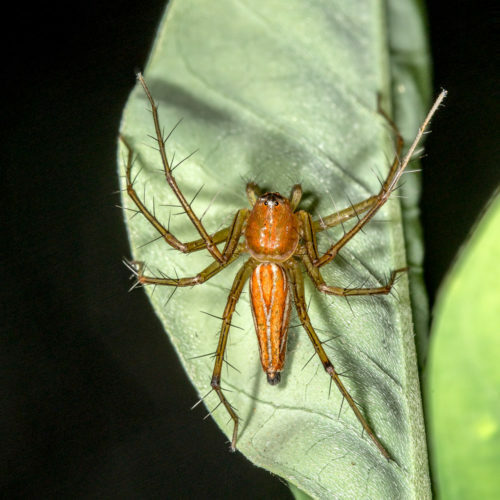 Abdomen long and thin, rounded and widest at the front and then tapering all the way to the spinnerets. 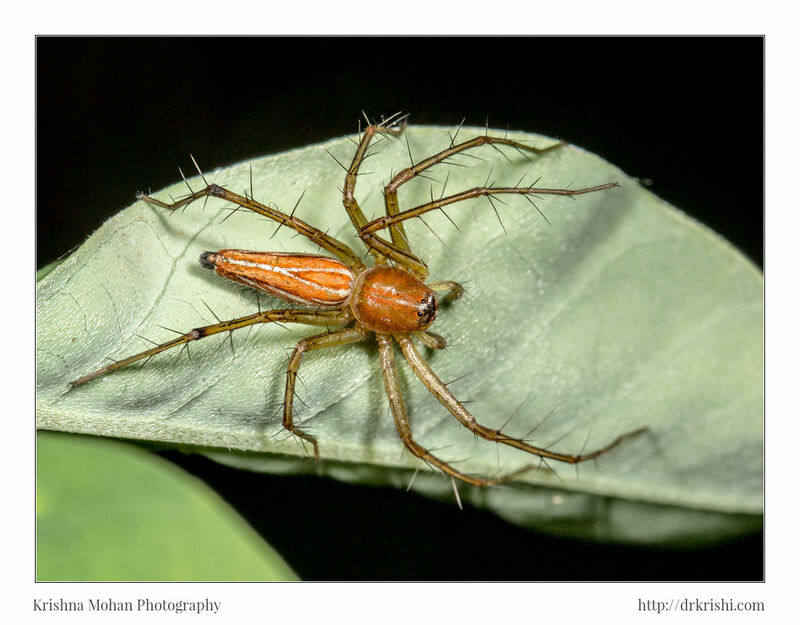 A total of 48 species of Oxyopes are reported from India so far. Some oxyopids may produce several egg sacs, while others only one. Lynx’s are very protective of their egg sacs, guarding them avidly. Many will not eat while guarding eggs, and often die of starvation as a result. 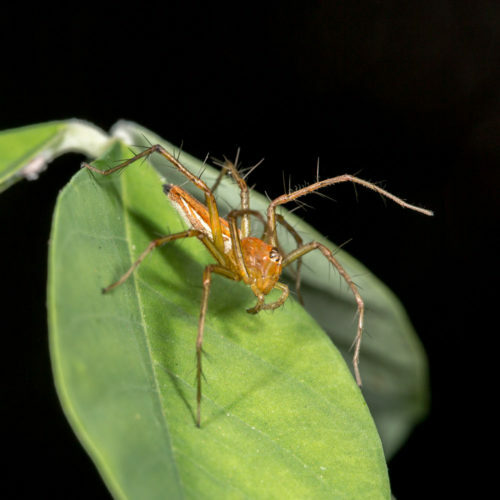 The eggs sac is fastened to a twig or leaf or suspended in a small irregular web. The eggs are guarded by the female. EXIF info - Aperture : ƒ/13 | Camera : Canon EOS 5D Mark III | Taken : 5 April, 2015 | Flash fired : yes | Focal length : 100mm | ISO : 100 | Shutter speed : 1/80s | Images and content Copyright © Krishna Mohan. Please contact me to purchase prints or for image publication license. EXIF info - Aperture : ƒ/13 | Camera : Canon EOS 5D Mark III | Taken : 5 April, 2015 | Flash fired : no | Focal length : 100mm | ISO : 100 | Shutter speed : 1/80s | Images and content Copyright © Krishna Mohan. Please contact me to purchase prints or for image publication license. Is that species are available in West Bengal? In which types of plants are the habitat ? They are pan-indian species, so should be available in West Bengal. 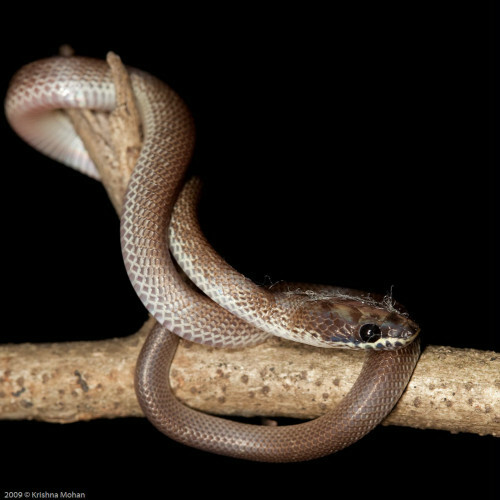 They are found mainly in shrubs and low level plants. They wait for the prey and ambush. Look under the leaves you should be able to spot them.